You quote Hatmaker as writing “We’ll have one moment to say, ‘This is how I lived.’” I think I know what she’s trying to say, but I wonder about the truth of that proposition. The Bible says we’ll have all eternity to talk about how we lived. We’ll be talking about what Christ did through us and not what we did. That truth keeps me from getting too wigged out about how I am spending each moment. Ha! I also tend to overshare about books. It can be a problem:). Nowadays, I just hand my favorite to the person I want to discuss it with, make them read it themselves, and THEN sit down to talk:). As for the “one moment” statement, I think Hatmaker is referring to the idea of judgment, in light of Jesus’ many statements and stories depicting that scene. I agree with you that we aren’t saved by our own power, but by Christ’s sacrifice. I think if we sat down and talked about it, though, you and I might have a Paul-James thing going on, where you emphasize faith, and I’m all, “But works matter, too!” Really, though, what I took from her statement was a reminder that I only have one shot at this life, and I want to live as fully as possible in God’s kingdom. And not because I fear that theoretical “one moment” on Judgment day–no, I rest in Christ’s love for that part. Instead, I want to seize (not get wigged out about, but seize) each moment because I am EXCITED about how I’m going to spend eternity, and I want to get some early practice in:). After all, if I plan on worshiping and serving my God in the afterlife, shouldn’t I seek to do it just as wholeheartedly in this life? I’m not sure if that made sense…it kind of came to me as I was writing it, and I reserve the right to revise it later:). It made perfect sense, Kim. That was an awesome explanation! loved her book. loved that she was very willing to laugh at herself (that helped me to feel like the 7 months were possibly doable for even me). loved that some chapters i thought, “oh, i’d have this one, easy!” and others made me think, “is she FOR REAL?!”. loved that on my kindle it was all in one size and one font (because that kind of writing style can be hard for me to read, too, kim). 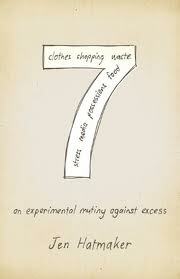 * i have attempted some variations of these seven before. now i realize i could do even more…and that at the same time i don’t have to. it’s not a program, there’s not a formula…as teachers say, it’s about the process, not necessarily the product. it’s about changing my way of thinking from day-to-day, not suddenly shutting down all the tvs in my house and having my whole family hate me. it’s about living and not just existing. it’s about making a conscious decision and not just letting things happen. * i can make some of these changes, but making them all at once would be foolish for me, because i would fail miserably (i.e., diet gone bad). i need to change things as they make sense, one thing at a time, and not go crazy and rearrange my whole life which would…. * ….create more stress and chaos! that is one thing i kept thinking as i read, was “is she actually creating MORE stress for herself and her family because she is trying so hard to follow the plan for the month?” i know that for us, i need to be careful that i am doing what i do for a reason and not just because it sounds like the “next” thing that everyone is blogging about. i am interested now in reading some of her other books. ( i did read barefoot church by her husband, brandon, which reminded me of the tangible kingdom by hugh halter.) i am also inspired to start taking some of her ideas and implementing them within my family. i am finding myself embracing minimalist living because of the peace and quiet it brings mentally/ physically and because of what i frees me to do for His kingdom, and her book was definitely practical in that arena. I agree, Ann. In terms of practical application, I wasn’t interested in replicating her formula (nor was that her point, I think) b/c, like you, I wanted to avoid the “diet” mentality and go for maintainable lifestyle changes. Also like you, I was already on her thought path before I started reading, so this book gave me more inspiration on how to continue and improve things our family is already doing. It was a good shot in the arm, an encouragement to keep working to serve God better with our resources. Apparently I’m getting a kindle for my birthday (yay! ), so I’ll have to add this one to the list of books I want to read. Sounds interesting. Well, you dont need ot hear this here since you have been hearing it non-stop in our own “Council” meetings but …I love this book. For all the reasons you mentioned, I love that this book is challenging without imposing guilt. I love that it reflects a real gal who is just trying to be a little more like her Christ and is willing to wear moldy jeans to prove it. I think that there were a lot of things I would do different were I to (and I were ..will) do a form of the seven fasts, simply because my struggles in those areas are different. I, for instance, would restructure the ‘clothing’ fast more around the excessive spending/time/energy spent on beauty – partly because buying clothes excessively is not a big issues of mine, and while I could certainly get rid of stuff you aint gonna find any tags in my closet or any other name brand besides “Old Navy” …clothing itsel fis not a big struggle, but the whole focus on appearance is, and so I would focus my fast on that instead. I loved the challenged thinking in terms of how we spend, how we eat, how we shop and what we do tot ake care of the earth. If we eat limited, for instance but then just go right back to how we ate before what we gained? Or if we dont spend anything for a month, but then then overspend the next have we gotten any benefit in the long term aside from knowng that we can? If she does that in the last two chapters or not, I will still be passing this on and collecting my own Council so I can hope gain at least as much from her willingness to limit things. This is my first JH book – but I will be looking for others, as well as a few of the ones she mentioned throughout the book. Haven’t read the book but I will say that given our family’s recent struggles with food sensitivities: consult your physician or nutritionist before embarking on any diet that restricts you to 7 foods in a month. Humans need a lot more variety in our diet, not less. Maybe find a way to limit the quantity to 7, or 7 spices or something? Over exposure to certain foods can trigger allergic reactions in the body, which can be especially harmful for the little ones. Yeah, it never once occurred to me while reading to actually do her fast…and she never suggested that we do it with our children, or even on a long-term basis for ourselves. Like you said, my struggle is making sure my kids get enough variety in their diets. The 7 diet is certainly not one that would be healthy long term situation, just like shopping at only 7 set establishments would not be something that could be maintained in the long term. I think thought that in the short term the simple act of limiting anything is a good way to get our minds and hearts focused on something other the effort it takes to acquire those things. Definitely, Court. It is definitely a fast, not a lifestyle choice, as the book makes clear. Fasting long term isn’t healthy, of course, (if it was a traditional fast, we would starve! ), but in the short term, it serves to focus our minds and souls on God.